My friends, this is one of the best times of the year! 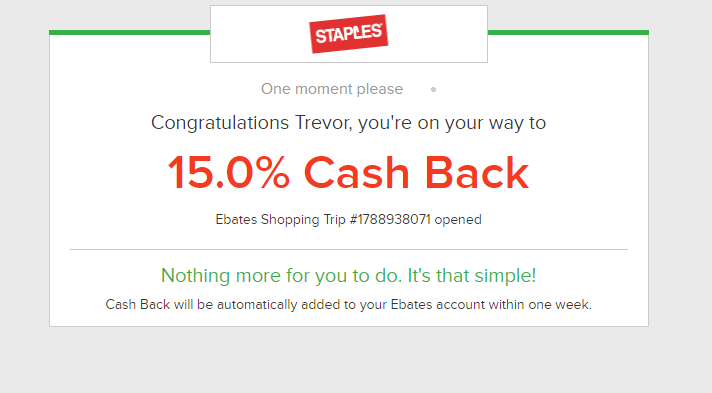 Every year, Ebates celebrates their birthday, I’ve covered many of the last few years, but the best day of Ebates Birthday week is always when they include Staples at 15%+ cashback. Alas, Ebates Birthday 2018 is proving to be a fun week to be buying online! I’ve long espoused the benefits of Shopping Portals, though sometimes its better to go for cashback instead of points. This is one of those cases! Ebates has a ton of stores at 15% cashback today, and this week. There are many more stores to choose from. If you were holding off on making a purchase, now’s not a bad time to maximize the cashback portals. Just in case you don’t already have an Ebates account, I’d be awfully grateful if you’d consider using my referral link, it’ll get you $10 when you join and spend at least $25. In full disclosure, I will get $25. For me, the best part of Ebates Birthday 2018 is the fact that Staples is back again! The best part is that this is completely stackable with your Chase Ink Plus for another 5x! May is a great time of the year, especially for cashback shopping portals. Ebates has been celebrating their birthday week for the past few years, and Ebates Birthday 2018 has just as many great stores, if not a few more surprises, as compared to previous years! How much Ebates Birthday 2018 cashback will you be making? @Rick, Most of the portals specifically state gift cards are excluded from cashback. I think some portals may pay out, but in my experience, Ebates hasn’t in ages.